Last week, retired Grace Brethren pastor Don Shoemaker, wrote in observation of the 50th anniversary of the March on Washington for Jobs and Freedom, which was held on August 28, 1963. Originally published on his LinkedIn page, it is reprinted here with his permission. I wish I had been there to see and hear! Dr. King’s timeless speech on August 28, 1963 goes down as one of the great speeches in America. I’m reminded that the strongest portions of his speech were improvised. I did get to hear him in 1966 when he spoke at a Baptist church in my Ohio hometown. 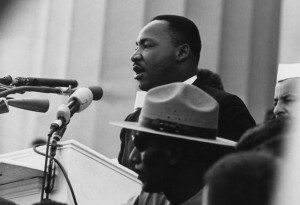 The God-grounded, faith-based, scripture-laced nature of the movement he led is obvious from any fair listening to his historic speech and reading his “Letter from Birmingham Jail” and his autobiography. Biblical quotations, passions, imagery, and examples abound. You won’t hear that brought forth very clearly or often in the extensive current commentary on the March on Washington as we observe its 50th anniversary. Putting specific issues aside and looking at the foundations of the movement, we wonder if his message would be in sync with today’s secularized thinking and its marginalization of religious influence and expression. Last month my wife and I visited the King Memorial in Atlanta. Seeing the historic church (the congregation now gathers at a large, modern edifice across the street), the tomb, his childhood home and the visitor center was a moving experience I would recommend to everyone. Again, I was impressed anew with the religious foundation of his life and work.